Gintai toddler kids girls boys animal backpacks are made by neoprene as diving material/anti-tear nylon fabric/canvas. The super cute animal backpack makes your kids easy to carry around, it is very useful in teaching kids young how to organize their items. It is cute and lovely backpack and toy for your toddlers. The padded shoulder straps are also adjustable, making them comfy for little shoulders.Very suitable for children as a holiday gift. LIGHT WEIGHT,BRIGHT COLORS-This lovely cute toddler Butterfly backpack is a perfect gift for 0-3 years kids. Lightweight,elastic and soft. 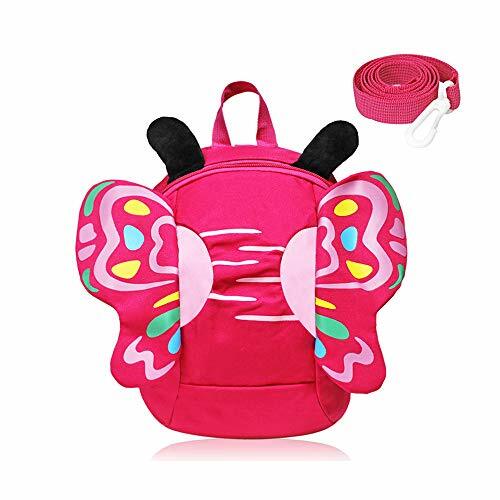 UNIQUE DESIGN-Super cute cartoon 3D Butterfly shaped design, durable,stylish appearance, Not only can be used as a backpack, it's also a toy and a friend. Suitable for many occasions, kid's school season, Ideal for going to kindergarten, travelling, a trip to the zoo, playing at the park and other outdoor activities. ADJUSTABLE COMFORTABLE STRAPS-Dual adjustable comfy straps in air max back material, perfect for school, hiking, travel.The padded shoulder straps are also adjustable, making them comfy for little shoulders. LARGE CAPACITY-There is a roomy main compartment in the backpack. Plenty of space in the backpack to store your kids's toys, books, snacks and more. Backpack size: 10 x 7 x 5 Inch(L x W x H). SAFE MATERIAL-This kids backpack is made of nonirritating canvas, won't cause skin allergies. Whether they are going to school, or going on their first big adventure, your little one will love carrying their very own backpack.